Leaving on a road trip is always a thrill. The car is all packed up, you don’t have to unload or worry about checking in at the airport, you’re all set up with your driving music and snacks. This is the way Ashley and I felt as we locked up the house and started the car. She had a late class, so I picked her up from school and we were off. 50, 60, 70 mph: we picked up speed and I turned up the music. We began to feel free of the confines of the city and of our day to day lives. 60, 40, 30, 15 mph: it was 3pm. We hit the start of L.A. afternoon traffic and began to creep. Oh well, it was going to be a great trip anyway. at our first destination, Laughlin, NV. To say that Laughlin looks better at night is to be kind. But truly, if you squint and look at the city from across the river, you might even think it is pretty. Laughlin is to Reno what Reno is to Las Vegas. It has gambling and some bright flashing lights, but not the amazing hotels, great restaurants, and shows of Vegas, nor the proximity to natural beauty or ski resorts of Reno. But what drew us to this oasis in the dessert were the $20 rooms at the Flamingo (now the Aquarius) and the perfect proximity from L.A. for an evening of driving. The night we got in, we did the requisite gambling and got a free virgin (though not according to them) cocktail. Needless to say, we were excited to move on the next morning and get to the meat of the trip. Driving out of the city, we got our first taste of what lay in store for us: the hills began to change from a dusty brown to a powered red and their shapes began to appear more dramatic. old towns were deserted. 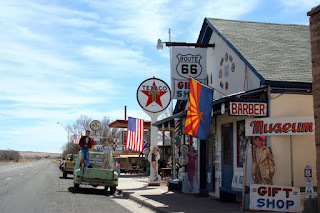 But the stretch from Kingman to Ash fork still has some of the old time joints. We had lunch at one such spot: Mr.D’z. I always got a kick out of seeing the historic Route 66 sings while driving down Santa Monica Blvd in Los Angeles, so it was fun to see the road in this western context. Our first real stop was Sedona, AZ. Ashley had gone there once for a wedding and had fond memories of the activities it offered. The one in which I was particularly interested was the slide rock park. Not far off the main road, we pulled over and changed into our swimming suits. 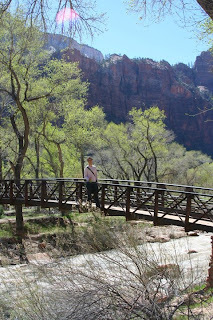 The sun felt good on my back, but I wouldn’t describe the air as warm as we walked up through the canyon. Slide Rock Park is a narrowing in the canyon where water has carved a narrow enough path that one can sit at the top and slide down the rocks—a natural water slide. I have noticed that when it comes to cold water, there are levels of temperature tolerability that I keep in mind as an ever-ready thermometer. If there are adult men and women in the water, it’s generally pretty comfortable. If only adult men are in the water, it’s likely cool, but still tolerable. If only children are in the water, it’s definitely a bit chilly, but if just young boys are in the water, you can bet it is down-right cold. Being April, the main water source was snow runoff and, as you might imagine, only desperate boys were playing in the water. Desperate boys and me. I reasoned that I may not have the opportunity to come here again and so I had to go for it! I eased in and felt my, eh hem, whole body contract with cold. But once I let myself go, I was swiftly carried down through the water. It was quite a fun ride, but as soon as it slowed I was out of the water like a rocket, trying to warm up on the sun soaked rocks. After exploring up the canyon, we headed back to our car and looked around the town. We had heard that Airport Mesa was an excellent spot from which to view the sunset, but we still hadn’t checked in and were excited to put down our bags and check out what we expected to be the nicest hotel of the trip. We deiced to drive up the road, reasoning that we couldn’t miss a good sunset among rocks. To our delight, our hotel–Sky Ranch Lodge–was directly adjacent to the location we were advised to watch the sunset. 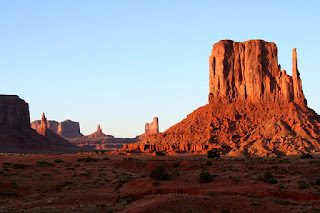 We dropped our stuff off in the room and went out to watch the already red sunlight reflect off the red rock cliffs, together casting the valley in a ruborousglow. 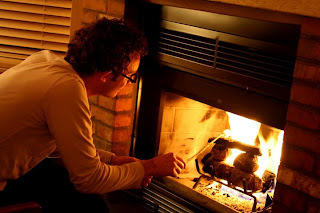 We had dinner downtown, then returned to our bird’s nest hotel to roast marshmellows in the fireplace and admire the moonlight-bathed valley. After breakfast at The Wildflower Bread Company the next morning, we decided to go on several hikes around the valley. It was great to get up close to the cliffs we had seen looming in the distance, and it seemed that most any of the trails we could have taken would have accomplished this. 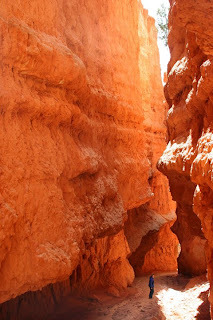 We were particularly interested in the hike that would take us through Boynton Canyon, where one can see caves where the Native Americans used to live. Walking down the trial to the right were more beautiful red rock cliffs, but to the left, the buildings of the luxurious Enchantment Resort kept peeking through to the trail until they eventually seemed to block the trail. It was a bit frustrating that after walking for 30 minutes, we were still so close to people who could just drive their car adjacent to where our location. That evening, we returned to the downtown area and explored some of the stores. 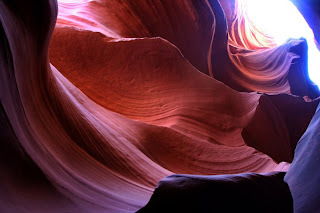 Sedona is known as a place that once can reconnect with your spiritual self and is claimed by some to be a vortex, a place where “energy” is concentrated. I personally felt pretty tired after the hikes, but I might have misunderstood the energy they referred to. Perhaps it was economic energy as there were ample opportunities to buy new-age hippie paraphernalia, such as crystals and blown glass, as well as southwestern art in the forms of statues and paintings. Still, there are enough galleries and stores for most anyone to find something he or she likes and there are many ways that one could take a spiritual sojourn here. 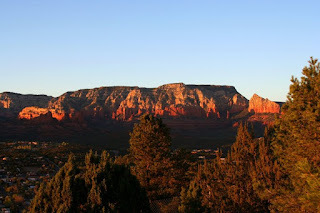 In fact, I would really enjoy a return to Sedona–it offers such a wealth of activities; and its setting amidst red mesas, pink sandstone, ponderosa pines, juniper trees, and cool canyon creeks is jaw-dropping gorgeous. As we drove out of town the next morning, hot air balloons greeted us from the skies, a seemingly wonderful way to see the area. 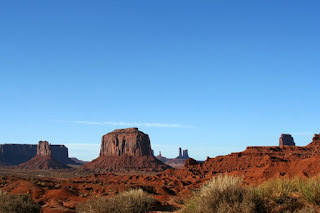 We took I-17, a scenic road, headed toward Monument Valley. We passed through alpine forests, then desert planes as we traveled. Our first detour was to Sunset Crater Volcano National Monument. Here, an eruption around 1000-1100AD left a dramatic scene of lava rock and cinders that is still surprising desolate. We decided to purchase the National Parks Pass for $50, knowing that we would be visiting at least three National Park sites on our trip (most parks have a $20 vehicle entrace fee). However, this pass has since been discontinued and replaced with America the Beautiful National Parks and Federal Recreation Lands Pass, which retails for $80 and allows unlimited access for one year. (Seniors can purchase the same pass for $10). get close to an archeological site. The visitor’s center has some good displays, but walking through the old buildings really gives you a sense of just how hard it must have been to live in this desert. Next we drove on to the Navajo National Monument. This is the access point to see some of the most wonderfully preserved cliff dwellings in the country where, amongst other puebloans, the Hopi and Navajo people lived. 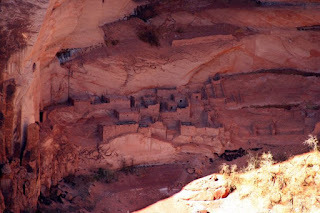 One has the option of taking a short hike along the top of a canyon and peering down across the valley to see the pueblo, or to take a hike down to the Betatakin ruins themselves. The latter requires a guide and at least 4-5 hours, but can be coordinated once you are there. According to the Park Service: “[The s]trenuous 5-mile round-trip hike…begins at 7,300 ft. elevation; loses and regains 700 ft.” The former, which is what we elected to do, is self guided and takes about 20-30 minutes in each direction. If you are interested in seeing some fascinating ruins, this site cannot be beat. 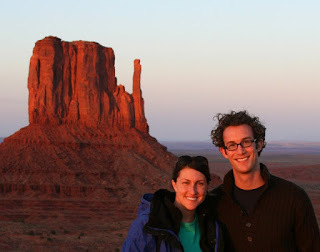 After the hike, we pressed on to Monument Valley in Utah, part of the Navajo Parks & Recreation domain. 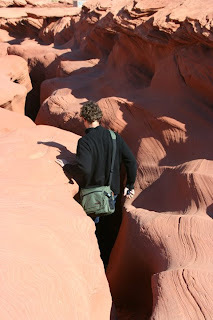 As we approached the area, the cliffs became steeper and the rocks redder. A true child of the 80’s, Ashley couldn’t help humming the theme from National Lampoon’s Vacation. It was hard to drive without pulling over every few minutes as each view seemed better than the last. We had arranged to stay at Goulding’s for two days (camping one night, staying in the hotel the next) but after reading our guide book more closely we felt we could see the park adequately with just one night. We decided to splurge and stay in one of their private cabins. The cabin was really fun, and was the best part of Goulding’s: the other facilities, including the restaurant, were fine but nothing exciting. But it’s currently the only option if you want to stay close to the park (I hear that the Park service is opening a new hotel and spa called The View in the near future). favorite of John Ford, the western director, and one can easily see why. The land is so fantasy-like; it is no wonder that when drawings of the location reached back east, many believed it was too bizarre to be true. We exited the park 10 minutes before the sunset and watched as the park turned to ever-more impossible colors of red. And though there are various parts of the park open only to those with a guide, Ashley and I felt what we had just seen would be hard to top. maneuvered our way down through a gap just wide enough for our bodies. As we descended, the colors shifted as the light was bounced back and forth between the canyon walls—from yellow, to red, to blue to purple. Honestly, it was hard to walk through the canyon, not because of the terrain, but because everywhere I looked I encountered another amazing scene. Eventually we made it though the canyon, but on the way back, the angle of the sun had changed enough that all the angles looked different! I could have stayed down there for hours! 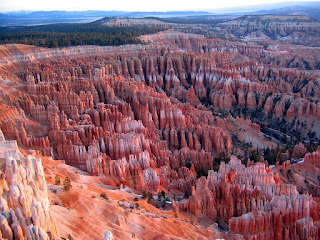 Somehow, I pulled myself away and we continued our ascent to Bryce Canyon. 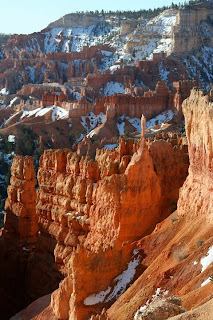 When we arrived, we checked into Bryce View Lodge, and went for a brief hike around the top of the canyon. Ashley claims we were lost in the snow, but I knew where we were (almost) the whole time. I tried not to let on how relieved I was when we spotted the trail. sunrise was vastly superior. There were deer wandering around the woods behind us as the sun peaked over the ridge and cast its light on the rocks. In the afternoon, we took a hike through the hoodoos. It was hard to appreciate just how large they are until you are standing right up next to them (Ashley is in blue)! After showering and resting up, we went to the Bryce Canyon Lodge for dinner. From our trips to Yosemite we have developed an interest in National Park lodges. This lodge was originally associated with the Santa Fe Railroad, and had an attractive decor and architecture which fit well into its surroundings. Their food was good; but I always want these lodge restaurants to have more game food, and take advantage of more local flora and fauna. This lodge did better than some, with a local trout, and local cherries in a sauce for a pork chop, but could have done better yet in my mind. Nonetheless, it was fun to see the lodge and try the restaurant. the most extensive national parks we went to, one that offered some of the most intriguing hikes and diversity of landscapes. We parked our car at the main parking lot and took a bus (there is limited car access on most of the roads) for our first light hike. 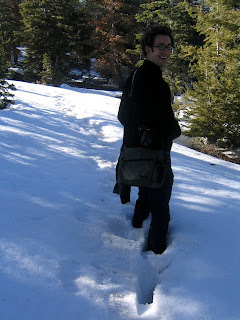 Sadly, this was to be our only hike. By its end, I was feeling so ill; I had to lie down for almost 30 minuets to recuperate. After losing my lunch, I struggled back to the car, and then passed out in the hotel room at the El Rio Lodge. So, basically, Zion was no fun, but by no fault of its own. I look forward to returning there sometime soon. 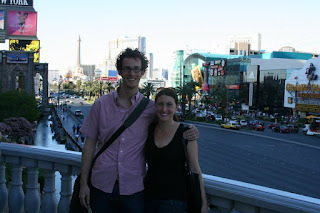 Our last stop on our Southwest adventure was Las Vegas. We’d been there several times before and have always enjoyed exploring the hotels and walking the strip, though gambling isn’t our thing. We chose to stay at the end of the strip (at the Sahara) where the hotel prices are better, but from which you can still easily access the strip and some of our favorite hotels: The Venetian, New YorkNY, and Caesar’s Palace. Before the trip, we had forwarded our itinerary to Ashley’s parents. To our surprise, when we called them to say hi, they mentioned that they had found a good hotel deal in Vegas and were going to be there the same weekend as us! And surprise, that good deal was at our hotel. Surprise! We were a little slow in figuring out they had been planning this all along. 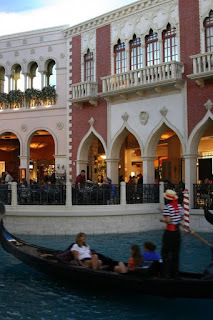 restaurant located in The Venetian. Fortunately, the illness that struck me left me as quickly as it came on and I was ready for some fine dining. I tried the pork belly, the special dish of the day. It was amazing. I’ve ordered this cut many other times in other restaurants since and nothing has compared. Ashley had the mussels and was similarly wowed by them. 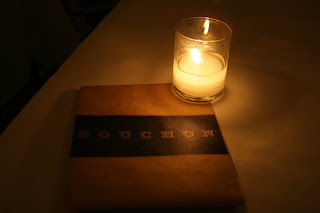 When we go to Vegas next, Bouchon will be a sure stop! After breakfast with Ashley’s parents, again at Bouchon (it was just so good!) they drove back to Southern California while we drove to Northern California to visit my parents and my sister’s family, who had flown in from Germany for the Easter holiday. 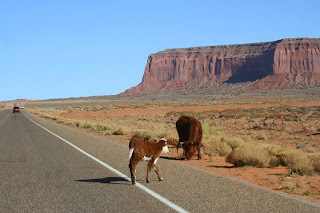 The Southwest is laid out perfectly for a road trip and despite all that we did, there is still so much more we could have done at each location, not to mention the great locations we had to skip, such as the Grand Canyon and ArchesNational Park. But that will just make the next chance we get for a road trip in the Southwest all the more exciting!